Must Share Twice to Purchase. Use Share Icons Next to 'Get It' Button. Ticket mailed to the Chicagoland shipping address provided when purchasing. Please visit amctheatres.com for additional info. Enjoy an entertaining family night, a romantic date or a comedic reunion with friends with this golden offer: $4 for an AMC Silver Experience™ ticket up to a $10 value. With purchase, you will also receive a FREE subscription to the quarterly print edition of Deals Magazine, mailed to you. Deals Magazine will never cost you a penny, but will save you millions of them! Allow 7 business days for delivery. 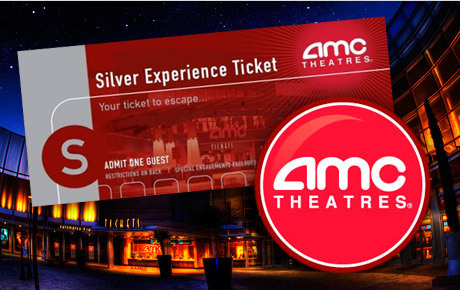 AMC Silver Experience™ ticket will be mailed to Chicagoland shipping address indicated at checkout.